and a female cardinal at the feeder. It's time for you to link up again! There are just a few rules. I love the one of Maisy in the fountain, so cute! Hm, I don´t see the "linky thing" - is it my computer or is it just not there? Lovely shots Deb - the cardinal is gorgeous. I cant see the linky either.. I adore your backyard, Deb! Cute photos. Especially your pup getting a drink. Cardinals seem to be very skittish so yes. You will need a longer lens. gorgeous! The hues in all of these are so cozy and summery! Wow...these are some amazing shots Deb! I especially love the on of Maisy having a drink! Wonderful summer impressions and beautiful pictures. Great shot of Maisy. My dogs won't quit drinking out of the hot tub - yuck! Thanks for hosting the party. This is my first one with you and I can't wait to check out some of the other party goers posts. 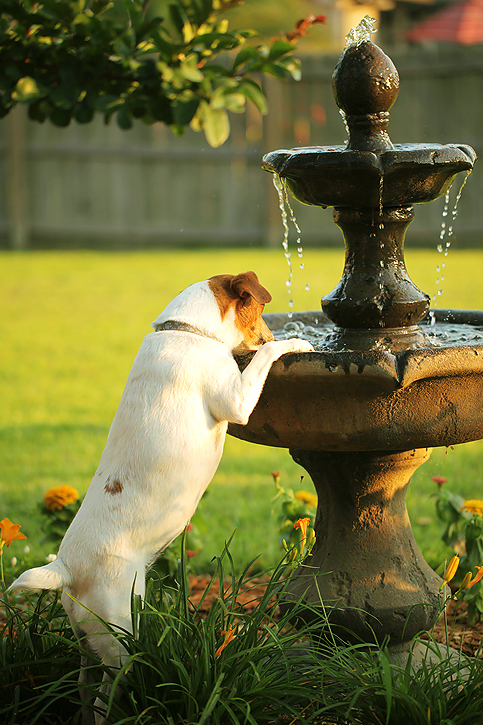 I catch my dog drinking out of the bird-baths all the time...looks like you are having a lovely summer. Yea for summer!! :) Love that image of Maisy drinking from the fountain. Too cute! 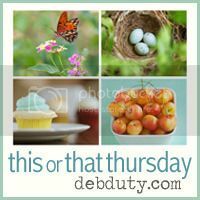 Have a great Thursday Deb. 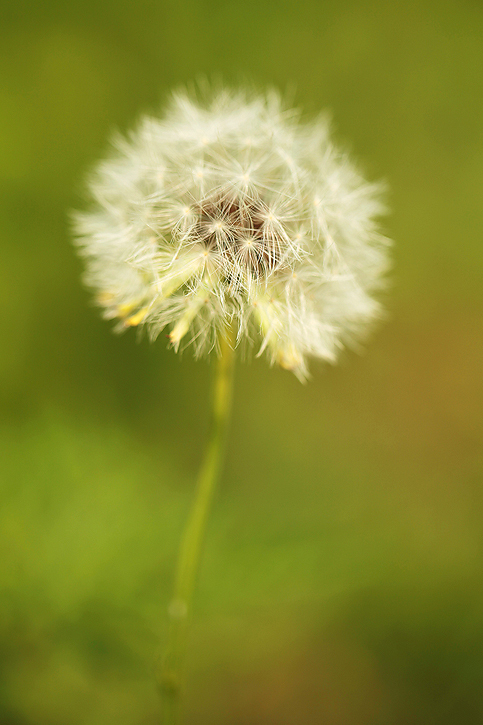 I have yet photograph a dandelion close up, yours is a beauty. Deb, we enjoyed your butterflies so much! Andrew and I studied them and had so much fun watching. Thank you for sharing them with us! All great things Deb. I would so love to just sit out there in your yard with you & enjoy the sights. I love your dog photo, perfect! all awesome photos!! I couldn't pick a favourite if I tried but I find the cardinal one very impressive! I never quite seem to be able to capture them! Great work! Beautiful summery photos! 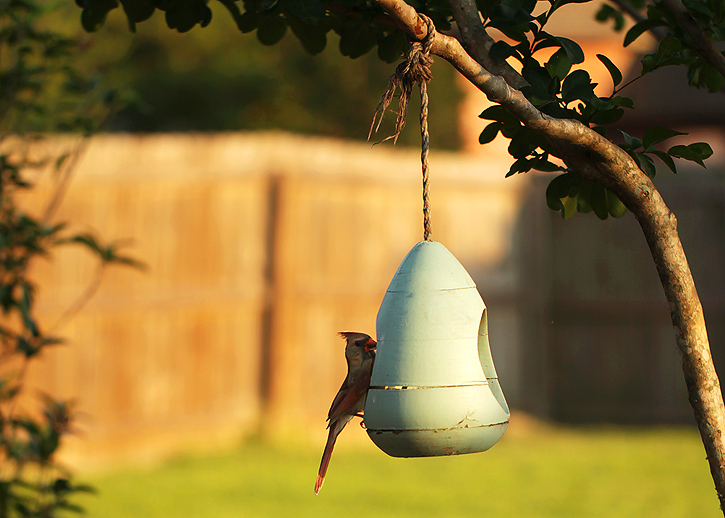 I love your bird feeder! AWESOME shots - love the one of Maisy drinking from your fountain!!! All beautiful shots although I have to say your middle one is my favourite. Great bird shot! Have you thought of setting up your camera on a tripod and using the remote. I have been thinking of trying that out myself. Beautiful photos! I love the one of Maisy drinking out of the fountain! Great shots, Deb! The dandelion is my favorite, the essence of summer! Thanks for hosting! Wow! These shots are so beautiful! I am a bird enthusiast so it is great to see the cardinal among these pictures! :) I am a new Follower of your Blog. Have a great Thursday. Yeah summer!!! Love that fountain! I have been wanting to get one for awhile, I just love how relaxing they sound. I love your summer photos...the fountain one is precious! Lovely summary shots - I love the one of Maisie at the fountain. Dandelions are so underrated, don't you think? I can see that shot as a huge poster on a wall in my house. Gorgeous. I am so totally and completely in love with your random summer pictures. Gorgeous! Deb your pictures are beautiful. How do you get the background in a blur and the dandelion up front. Is it the Macro on flowers. Your captures are awesome. I want to learn that. Can you give me a tip. I can get the pictures close but the background is not what I want all the time. I just want the subjects like you. Getting the background blurry is a matter of how close you are to your subject and the aperture that your camera is set at. I use a macro lens which allows me to get close and I open the aperture to a wide setting. The farther away you are from your subject, the more of the scene will be in focus. So if you're using a macro lens and shooting really close to your subject, you can use a smaller aperture (bigger number) and still get a blurry background. If you aren't using a macro lens then you usually want to use the widest aperture you have (smallest number). Feel free to ask me more questions if this doesn't make sense!